The Case For Copper Is Extremely Strong | Beckett Bronze Co., Inc.
Beckett Bronze Company was incorporated May 21, 1913 as the Delaware Brass and Aluminum Company by a group of stockholders which included John Beckett, a molder, and his son, Charles. The midterm elections in the U.S. are mostly behind us — with the exception of a few recounts — the end result will be more gridlock until at least 2020. How will that affect the junior resource space we speculate in? It means there will be very little the two corrupt parties agree on, with infrastructure being the possible exception. Infrastructure is necessary, brings good-paying jobs to people who need them, and is a way for both parties to fill up their individual and collective (state) coffers. The truth is copper — despite the recent pullback — has, along with uranium, one of the most compelling investment cases I’ve seen in a long time. While everyone is busy paying attention to the trade war, copper premiums in China have surged while global inventories have plunged. The inventory decline comes despite a relatively calm year in the way of supply disruptions and a perceived slowing of the Chinese economy. Copper is down 16.7% this year. The juniors are down even more. Tariff worries are a legitimate concern. China is responsible for nearly half of the world’s copper consumption. Despite the bearish sentiment, global demand remains strong. 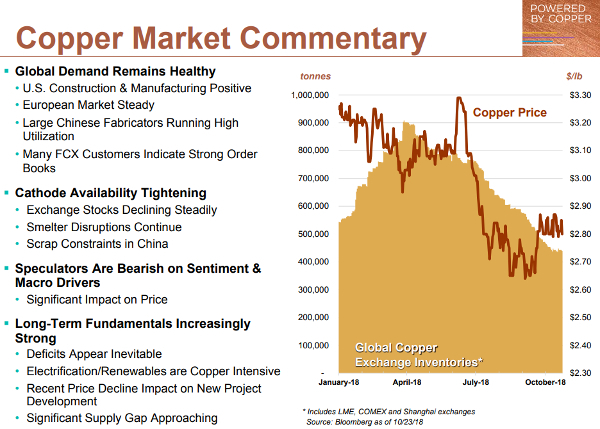 The most recent earnings call from copper giant Freeport-McMoRan provides some good data to ponder. The main takeaways are that speculators have been bearish and have been driving the price down through short positions. That’s the short game (pun intended). I play long-term trends. In the words of Freeport: deficits appear inevitable. The recent price decline is only going to exacerbate that as new project development is starting to be shelved. You’ll Never Be On The Inside! Most agree that $3.30/lb. copper is needed to incentivize robust expansion and exploration. Supply disruptions have been minimal this year. That won’t always be the case. 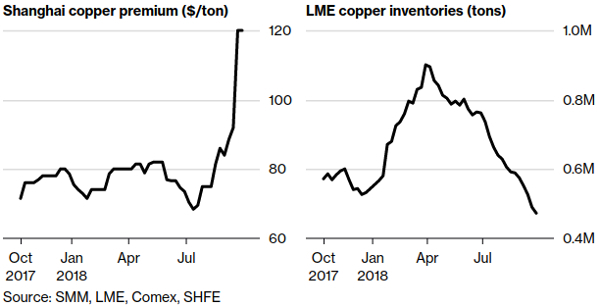 Here are the six-month and five-year charts of LME copper inventories. The electrification of everything is a real trend that is accelerating by the day. Copper is my favorite way to play that. 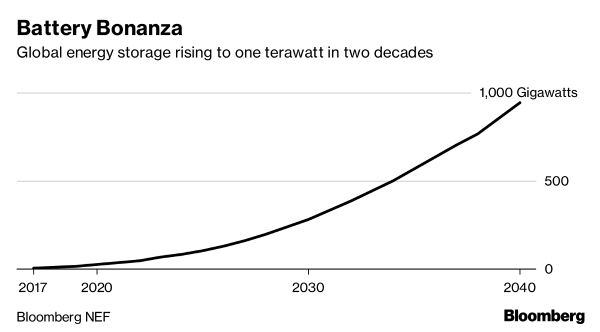 The global energy-storage market will surge to a cumulative 942 gigawatts by 2040, according to a new forecast from Bloomberg NEF published last Tuesday, and that growth will require $1.2 trillion in investment. Falling battery costs is a key driver of the boom. BNEF sees the capital cost of a utility-scale lithium-ion storage system falling another 52% by 2030. In order to have renewable energy, we need storage. Another important point that often goes unnoticed is that although the majority of storage capacity will be utility scale until the mid-2030s, smaller-scale installations at businesses, industrial, and residential sites will overtake utility scale. In the near term, the potential for a Trump deal with China that provides a clear path forward — without the constant threat of trade tariffs — make copper, and the juniors that find it, look primed for a multi-year run that surprises the most ardent of bulls.